Chamblee’s Olena Bilukha leads the undefeated Lady Bulldogs into the state playoffs. The undefeated Chamblee Lady Bulldogs (20-0) lead 16 DCSD tennis teams into the state playoffs this week. Chamblee plays host to Woodland of Cartersville at 2:30 pm at Chamblee High School on Tuesday. 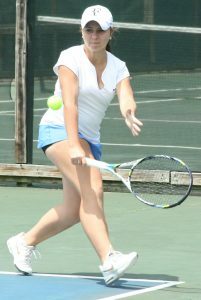 The Lady Bulldogs led by junior Olena Bilukha who is undefeated in singles play in her three years at Chamblee. Chamblee won the Region 5-5A girls’ and boys’ titles with the Lady Bulldogs making their seventh consecutive playoff appearance having advanced to the Elite 8 in 2014 and 2016. The Bulldogs (12-5) are making their 10th consecutive state playoff appearance as they entertain on Wednesday at 3:00 pm. DeKalb teams in action today (Monday, April 17) include the Region 4-6A boys’ and girls’ championship teams from Tucker. Both teams entertain Brunswick at 3:00 pm in Class 6A state playoff action at Sugar Creek Golf and Tennis Center. The Tigers are making their first appearance since 2015 and looking for their first state tournament victory since defeating Marist in the state championship in 1990. It is the Lady Tigers third consecutive trip to the state playoffs and fourth overall as they look for a first ever win. In other home action today, the Druid Hills Lady Devils play host to Spalding in the first round of the Class 4A state playoffs at 3:30 pm at the DeKalb Tennis Center. Druid Hills is making a second consecutive state playoff appearance and fifth overall. The Lakeside Lady Vikings (8-9) travel to South Forsyth for a 4:00 pm Class 7A state playoff match. In Class 5A boys’ play, Arabia Mountain travels to Cass for a 4:00 pm match in the program’s first boys’ state tournament appearance. Stone Mountain’s Lady Pirates make their first foray into the state tournament since 1996 as they travel to North Hall for a 2:00 pm Class 3A match today.